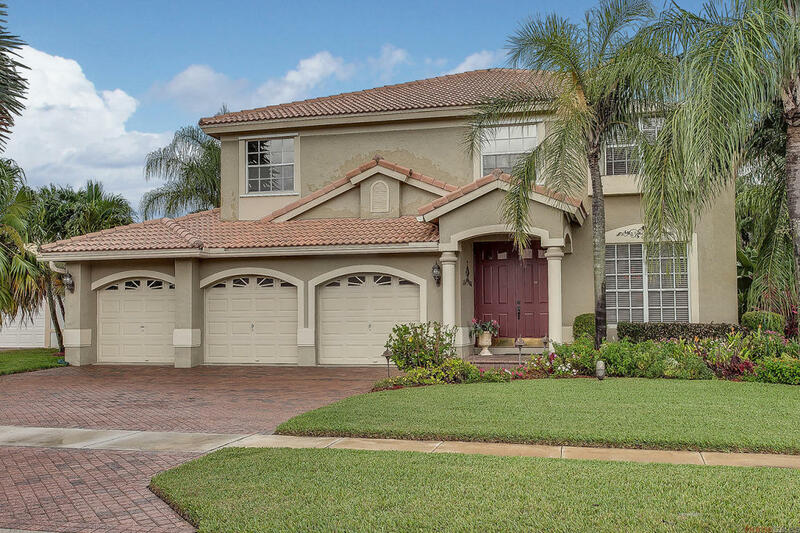 Exceptional, meticulously maintained 4BR 3BA 3CG home on a lushly landscaped cul-de-sac, corner lot features a gourmet kitchen w farm sink, 42” cabinets, granite & marble, walk-in pantry & breakfast bar. This tropical paradise boasts a oversized heated salt water pool, huge covered patio/lanai & overlooks the 12th fairway. Large private master suite extends to a sitting area & opens to a huge balcony. Custom accents include: crown molding, tile, wood stairs, wrought iron, wainscoting, outside speakers & mood lighting adorns tropical landscaping around the pool! Located in the heart of Wellington near the Equestrian Show grounds, Int’l Polo & zoned for A-rated Binks Forest Elementary, Wellington Landings MS & Wellington HS…this gracious home is a Must See!